It doesn't look like a very spooky room, does it? 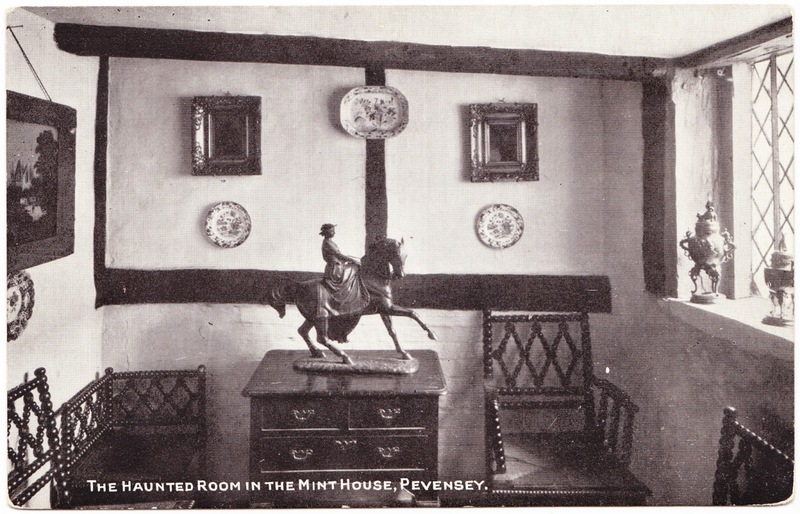 The "Haunted Room" in the Mint House in Pevensey, England, which is featured on this old postcard, looks perfectly cheery. Not like a place for ghosts and spirits. According to the wonderfully named Ye Olde Sussex Pages, the Mint House dates to 1342, while the site itself was used as a mint centuries before that — to the extent that it was mentioned in the 1086 Domesday Book. "Of course a building of this age simply must have a traditional ghost and next to the Oak Room is a little chamber — the smallest room in the house — which is reputed to be the abode of a feminine member of the spirit world, attired in costume of the sixteenth century. Many people have asserted that they have seen this spectre..."
"It occurred in 1586, when Thomas Dight, a London merchant, resided awhile in Pevensey with his mistress, having rented the Mint House from the owner, who was then abroad. Returning unexpectedly one evening and finding the lady in the arms of a stranger, Dight, in a fit of jealous fury, caused his mistress's tongue to be cut out, and then had her securely bound and carried to what was formerly the Minting Chamber. At the merchant's direction his men-servants suspended the captured lover by chains from the ceiling, and built a large fire on the stone floor beneath him. The woman was forced to lie and watch the struggles of the unfortunate man being slowly tortured by heat and smoke, until death put an end to his agonies. "In the stillness of the night his body was quietly carried down to the town bridge and cast over, to be carried out to sea. The woman was then carried to one of the upper rooms, where she was left, still with hands and feet tied. Lying there, without food or light, she suffered a lonely and painful death. "Her body was afterwards buried on or near the premises and nothing was known of the incident until Dight recounted it to his friends in a confession made shortly before his death in 1601." And so there you have it. Maybe this little chamber isn't the best place for you to hang out after dark, if you ever find yourself in Pevensey. I have a, possibly brass, ashtray featuring Ye Olde Mint House and Merry Andrew with no idea how old it is or how much it may be worth. I also have a Pevensey Castle pamphlet reprinted 1951.